↑ Most Swahili adjectives begin with either a consonant or the vowels i- or e-, which are listed separately above. The few adjectives which begin with other vowels do not agree with all noun classes, since some are restricted to humans. NC 1 m(w)- is mw- before a and o, and reduces to m- before u; wa- does not change; and ki-, vi-, mi- become ch-, vy-, my- before o but not before u: mwanana, waanana "gentle", mwororo, waororo, myororo, chororo, vyororo "mild, yielding", mume, waume, kiume, viume "male". Ashton, E. O. Swahili Grammar: Including intonation. Longman House. Essex 1947. আইএসবিএন ০-৫৮২-৬২৭০১-X. Brock-Utne, Birgit. 2001. Education for all—in whose language? Oxford review of education, 27(1): 115-134. Marshad, Hassan A. Kiswahili au Kiingereza (Nchini Kenya). Jomo Kenyatta Foundation. Nairobi 1993. আইএসবিএন ৯৯৬৬-২২-০৯৮-৪. Nurse, Derek, and Thomas J. Hinnebusch. 1993. Swahili and Sabaki: a linguistic history. Series: University of California Publications in Linguistics, v. 121. Prins, A.H.J. 1961. 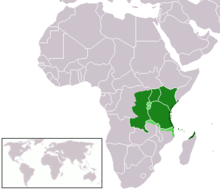 The Swahili-Speaking Peoples of Zanzibar and the East African Coast (Arabs, Shirazi and Swahili). Ethnographic Survey of Africa, edited by Daryll Forde. London: International African Institute. Prins, A.H.J. 1970. A Swahili Nautical Dictionary. Preliminary Studies in Swahili Lexicon - 1. Dar es Salaam.